L-com Global Connectivity, a preferred manufacturer of wired and wireless connectivity products, announced today that it has released a new line of USB cables with ferrite beads to suppress high frequency noise. L-com now offers both USB 2.0 and USB 3.0 versions of USB cables with ferrite beads on each end of the cable assembly. Ferrite beads prevent interference from a connected device or to a connected device. Ferrite beads also help to reduce electromagnetic interference (EMI) from either being radiated by a cable or being received by a cable. 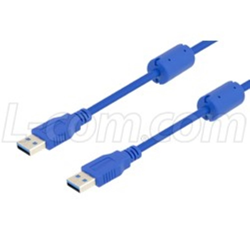 L-com’s USB 2.0 ferrite cables are offered off-the-shelf with Type-A male to Type-A male connectors, Type-A male to Type-B male connectors and Type-A male to Micro-B male connectors. The USB 3.0 ferrite cables are available with Type-A male to Type-A male connectors and Type-A male to Type-C male connectors. “Our new USB cables with ferrites are perfect for environments where too much EMI could pose a problem for USB connected devices. These new cable assemblies complement our already extensive line of USB cable options. We always strive to offer unique solutions to help our customers succeed,” said Brian Gates, Product Manager. These new USB cables with ferrites are in stock and available for immediate shipment.